Everything you need to stack and connect two 55 gallon water storage barrels. Racks are welded and powder coated here in the USA. Wide base for stability in every emergency situation. Assembles in minutes with aluminum bung wrench (included) and a flat head screwdriver. Water rotation has NEVER been so easy! 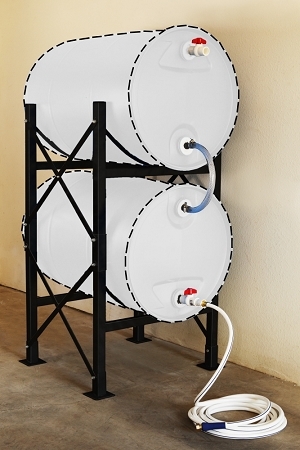 This system includes the metal racks and the plumbing kit but does NOT include barrels or the long hose in the photo. The instructions were very sketchy; I had to take it apart three times and correct for leaks; finally got it all set up and it is now working beautifully. Should have more detail about the plumbing parts and the importance of sealing and tightening everything properly. At least I had plenty of Teflon tape and extra parts. I"ve wanted this system for a LONG time b/c it (obviously) makes water rotation a LOT easier. But I finally realized that it does a lot more than that. This system keeps you water CLEAN. There is no need to introduce a possibly contaminated pump into it to get the water out. Why store water if you can't keep it clean? ALso, anyone (even kids and the elderly) can access water from this system. If I was not able to help my young kids, they couldn't get water out of a regular barrel with a siphon pump. My grandmother who lives alone couldn't either. But they could use this system. It is just smart! I did take a bit of work to put together. It took me about an hour and 15 mintues to put it altogether. You do have to follow the instructions EXACTLY (and email if you have any questions) so that it doesn't leak. But once it is all set up, all your work is DONE! Adding water and emptying it couldn't be easier. I highly recommend this to anyone. Q: If I want to stack 4 barrels, as shown in one of the pictures, can I do that by stacking two of these hydrant water storage systems? 349 points will be rewarded to you when you buy this item.